Ease and comfort find ways to remain evergreen in MarlaWynne designs. This sweater exceptionally no exception. Top off leggings, denim and even shorts for lightweight, endless wear. This sweater is fabulous. Canyon Rose is my new favorite color. I downsized 2 sizes as I do with Wynne Layers but then it was too clingy on my plus size tummy and bum, so I'm going to exchange and only downsize 1 size. I must find the perfect size because I LOVE this sweater! The problem with Marla.....she continues to bring items that are "so me". I have actually tried not watching a few times, because I tell myself, "I don't need anymore things!" I'm defenseless against the temptation. I ordered one of these tops, then went back for two more. 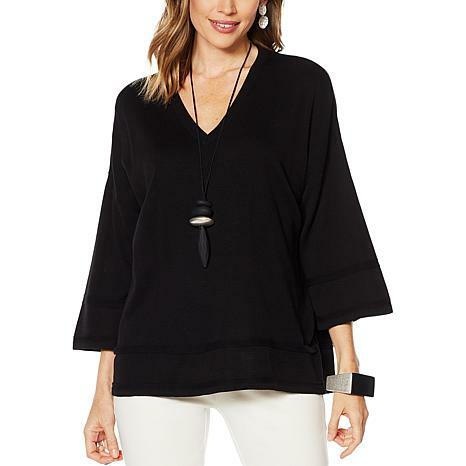 I love everything about this top, the material is gorgeous, the feel is just what I like, the fit is perfect for me. I would tell Marla to "stop it", but I think we would all be disappointed if she did. I purchased this sweater in seagrass - the color is perfect with my red hair & hazel eyes. The fabric is soft & the cut is generous but not overwhelming. I like Marla's description of her clothes "collapsing" into the body - that's exactly what this sweater does. Highly recommend! Marla I am having trouble saying no more clothes when you have tops like this. I am happy to say I am a Marla fashionista. The top just flows. I wear size medium and fits perfect. Bought in canvas to wear with skirt / poncho . Stunning! Runs a little big ... could have worn smallBut thought medium was the fit intended. Hope it washes & holds up well without snagging or pilling.